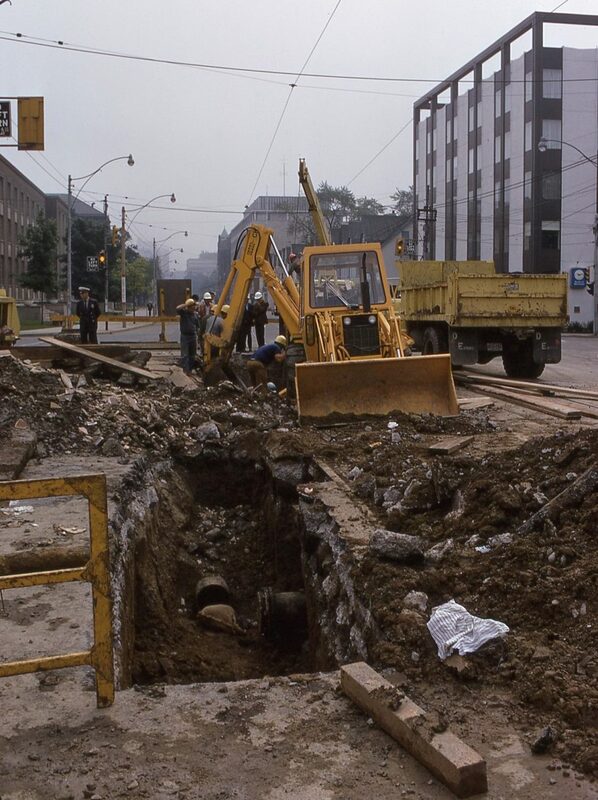 Back in June 1972, the TTC had a small problem with the appearance of a sinkhole under the westbound track on College at St. George thanks to a water main break. Fixing this was not going to be speedy. Streetcars continued to use the eastbound rails briefly, but the excavation needed to make repairs meant a complete shutdown of service both ways. Rather than leaving the Carlton car on an extended diversion, the TTC built temporary trackage on College Street itself with streetcars running eastbound in the curb lane. 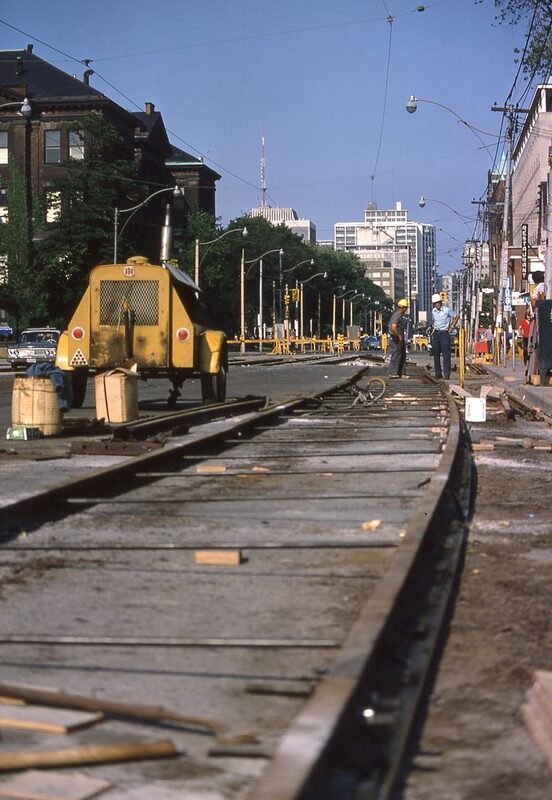 Until the temporary tracks were completed, Carlton cars operated via McCaul, Queen and Spadina. Here are views of those streets as they then were. With a nearly year-long replacement of streetcars by buses on College Street, riders might ask whether the TTC is up to something in its service plans. The explanation might be evident in a trial installation discovered by your intrepid reporter. More news to follow as it becomes available. Everybody has a transit plan these days. Even if it ain’t worth the paper it’s printed on, nothing stops an endless deluge of photo ops. Look at me! Look at the wonderful things I am doing for YOU! I am not a Mayor nor a Minister, and the likelihood of my getting a series of photo ops beyond selfies (and never mind that page in the Globe) is rather small. My needs are simple. My demands are few. I just want a pony. This will bring inevitable cries that precious resources desperately needed by the horsey sector out there in suburbia are being diverted to downtown. There will have to be a regional plan where ponies are included as a potential transit mode. Funding will be required. Environmental assessments. Business cases. Demand models. Consultants will grow rich studying the (re-)integration of four legged motive power into our transit mix while lobbyists, indistinguishable from used car salesmen, who will show us how the byproduct of this new(old) technology can solve all of our energy needs. Mayoral candidates will saddle up to endorse the scheme, along with their cohorts, a motley band of planners who cannot read maps, professors who grade on any curve as long as it results in an A+, and financiers who claim that equine transport will be self-financing. There will be an election. There are always elections. Every party will jump on the bandwagon saying that swan boats are outdated. Fie on old technology that doesn’t give the voters what they need, nay, what they deserve! Politicians will discover that well-trained ponies can be “self-guiding” and take riders to and fro without the need for a driver. A provincial agency will be created to harness this stunning new development! Its first hires will be a photographer and a publicist. The feds might even concoct a Pony Transportation Investment Fund. But I just want a pony, and I want it NOW. Alas, it cannot be. It is the process, the claims, the studies and above all the photo ops on which the transport world turns, not on actual delivery. We might even see a new pony barn built, but reining in taxes will prevent any actual ponies from cluttering up the civic plans and budgets. Updated January 29, 2013 at 1:45pm: Metrolinx’ response has been added at the end of this article. A discussion has been running in the comment thread on another article about one of the photos used on the Metrolinx site. The first of four photos in a rotating display is shown below. This is clearly an Intermediate Capacity Transit System line (ICTS), and it has been identified by readers as part of the Kuala Lumpur system. A strange choice considering that Metrolinx does not plan to build any ICTS in Toronto, or so they claim. At one point, it was clear that Metrolinx had no interest in LRT, and my advocacy of it at an early public speech by the former Chair Rob MacIsacc was not well-received. Simply “extending” the SRT to the airport was the preferred technology choice until the City of Toronto put its foot down with the Transit City LRT plan. I asked about this last week and am still awaiting an answer. Meanwhile the photo remains up on the site. The image in question is stock photography from a website known as Shutterstock. While the image may resemble the Skytrain, it has been chosen through a creative selection process. It should be noted that the image was also selected according to Metrolinx brand standards. Photography plays an important role in Metrolinx print and communication materials, which includes our website. Our images represent speed and action, giving the viewer a powerful sense of perpetual motion and transformation. When shooting or selecting photography, we always try to add a touch of green, or at least, select and/or use colours that will complement the primary colour palette and add to the unique flavour of Metrolinx. In particular, the image in question was chosen for its interesting perspective on city life, and has been blurred for use on the Metrolinx website as an artistic representation of rapid transit. We plan on changing the images on our website soon to in order to keep it fresh, and avoid the appearance of a static site. Well, that’s the longest “Ooops” I have read in some time. The shot does not “resemble” Skytrain, it is the same technology in use in another city, Kuala Lumpur. Updated June 27 at 5:20pm: I have written a political analysis of today’s announcement for the Torontoist website that will probably go live tomorrow morning. A line-by-line review of the plan will go up here later the same day. TTC Chair Karen Stintz and Vice-Chair Glen De Baeremaeker will formally announce a new plan called “One City” on June 27 at 10:30. The proposed funding scheme for the $30-billion plan presumes 1/3 shares from each of the Provincial and Federal governments. This money is extremely unlikely to show up, especially Ottawa’s share. From Queen’s Park, some of the funding is from presumed “commitments” to current projects such as the Scarborough RT/LRT conversion which would be replaced by a subway extension. The rest is uncertain. 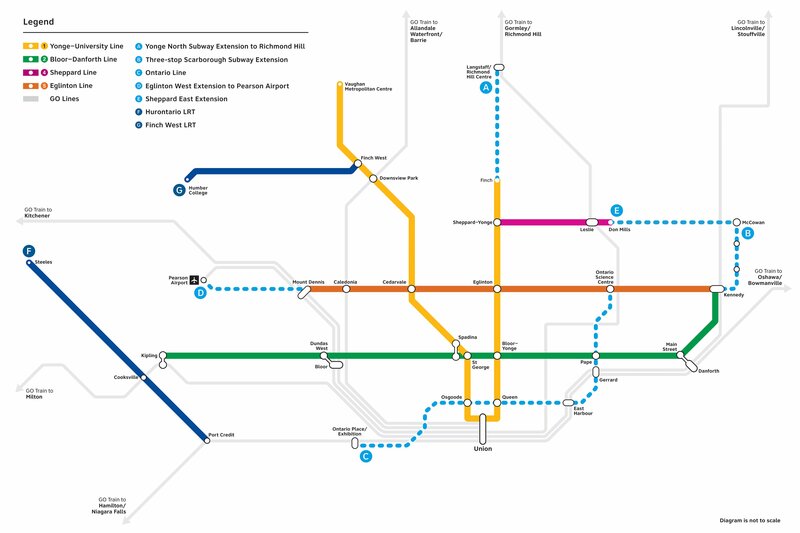 The “plan” is little more than a compendium of every scheme for transit within the 416 that has been floated recently in various quarters (including this blog). What is notable is the fact that glitches in some of the existing ideas (notably the fact that the Waterfront East line ends at Parliament) are not addressed. The whole package definitely needs some fine tuning lest it fall victim to the dreaded problem of all maps — once you draw them, it’s almost impossible to change them. For those who keep an eye on political evolution, the brand “One City” surfaced in April 2012 in a speech made by Karen Stintz at the Economic Club of Canada. This idea of a new, unifying transit brand appears to have been cooking for some time.